The printed circuit board looked very clean, no discolorations or defective looking components. The solder side (underside) is coated with conformal coating, not a stupid idea, water and electricity are not friends. When I bridged the blue wire coming from the pump (point 9008 Blue Wire Pump Ctrl) to neutral (point 9003 Flex Neutral), the pump worked, so I suspected it had to be the board. The Service Manual is not very helpful, it only indicates part 39 as the Power board PCB-Pump service kit with service code 4239 022 67101. The PCB has marking FLORIDA CONTROL BOARD V3). The power board is sold together with the pump for about €80. You can also get the board alone (423902267101) for about €65, but still a bit pricey if probably only one simple component on the board is defective! When I measured the DC voltages on the board I noticed the 5V rail sagging frequently to about 3,5V and the 54V rail sagged to about 21V. 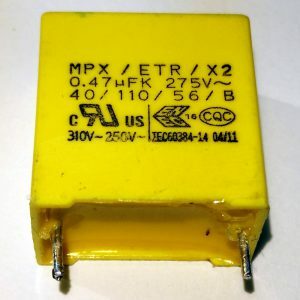 Before going down the rabbit hole and looking for a defective component suspect of pulling the voltage supply down, I decided to take a closer look to at the power supply circuitry. The DC power supply is made up of a simple capacitive dropper: Resistor 3001 (56R) in series with capacitor 2002 (0,47µF) is being rectified via diode 8001 to buffer capacitor 2003 (100µF). I desoldered capacitor 2002 and bingo: I measured only about 100nF and that is not OK.
After replacing capacitor 2002 with a new one, the pump worked again! I decided to go for a Würth Elektronik 890334025039CS: 0,47µF X2 310V (in stead of the 275V original). Make sure you get an X2 MKP (Metallized Polypropylene Film). Capacitor 470nF / 275 was dead too ! I checked the -5V, found 4Volt, when powered on, the Voltage drop to 2.3V. it is also good to say : when not in use : ALWAYS remove the power from the outlet wall ! measuring the dead capacitor : >> 20nf . Do we have to open the iron? How? Yes, you will have to open the case. You will probably need a screwdriver with a fitting Torx head for that. Found you page via Google as our 4.5 year old Philips Perfectcare Aqua was having the same issue. Didn’t have testers for the capacitor so got a similar capacitor from the local hardware store, soldered the new one in place and it seems to be working fine now. Total cost : Australian $3.50. I ordered one on eBay. Thanks so much. I will try now. Wait the result. Hi thank you for the comment it is very valuable . I have the same problem so I did the same following your instructions as I am not good at Electronics.However it did not work when I replaced the capacitor so I believe the root cause was not the same. As soon as I opened the device and took a look at the Florida electronic board I realized there was a missing part (at least it seemed to me). There was two written (IDENTIFIED) parts: “high” and “low”. At the “low” there was no part OR WIRE, and it seems there was missing something, some connection. The “high” identified part was just a wire, a high wire. Do you have the same at your boards? Is this a possible flaw? Thanks in advance! Dose anyone know what the problem may be ? Be sure to check the voltages on the PCB, but be careful, it is connected to live mains! When I measured the DC voltages on my board I noticed the 5V rail sagging frequently to about 3,5V and the 54V rail sagged to about 21V. Hello, I am very happy that it is a place you can rais your problems. problem: the steam does not get out, I checked the pump, and the steam valve under direct line they worked OK. so it looks like a problem with the electronic circuit but i don’t know how to check it and need help. On this blog I share my personal experiences with electronics and computers. Sometimes I can fix something and if I can help somebody with sharing that information, I am a happy person. But I am no support technician and this website is not a technical support forum. So I advise you to look in other places. say that this can be fully applied to new model GC9642 even if the board is different. Stellar Power Board VER4.0 WK 1510 but it also suffers from same issue as older series. boiler inside generating steam after temperature achieved beep was there but after switch press nothing. Between black and blue wire for pump there is capacitor MKP62 275 X2 473M 40/110/56B (0,047uF) but i measured it 0,033uF soldered out of the board. And voila the iron is steaming again with no problem. Buuu for you philips….new ver of board but old issue…. Djadjo, happy to read your comments. Pity that Philips still has not solved this problem. I have noticed the older irons had a physical on/off power switch but on the “modern” irons the electronics are continuously powered when the iron is plugged in, possibly wearing out the capacitive dropper due to some low quality parts. Have a nice 2019 and keep on repairing! @Djadjo I was really happy to find your comment, as my steam generator is almost the same version (GC9630) and the symptoms of the problem also identical, thanks for sharing that with us! So I bought new capacitors (MKP62 275 X2 474M 40/110/56B) which is slightly larger in size, but seems to have similar characteristics. I guess need to check more capacitors for failure. Just to mention that I can hear the pump functioning fine, and also when I push the steam button there is a clicking sound inside the generator (probably the opening mechanism for the steam valve), but unfortunately no steam. Please suggest if you have any ideas. An update to my story. Will update you in couple of days when receive the right capacitor. Looks like our more recent GC9540 has a similar problem. How did you remove the plastic coating from the test points? Scratching with the probes doesnt seem to remove enough for a good connection. Maybe the plastic coating is thicker or harder to remove on some models. The only advice I can give is “try harder”. Maybe scratching it off with a sharp knife or something. Success! Philips gc 7035 system ,power on ,but after a while it stops , the 3 led in front start blinking from right to left ,diong nothing else.